112,804 Boston people cast ballots in yesterday’s Preliminary Election. That’s way less than the 157,041 who voted in 1967’s equally intense mayor primary, but it IS more than voted in 2009’s FINAL. It’s a good number, and not far short of the 119,000 we predicted would vote. You all know by now the result. Marty Walsh, with 20,838 votes, made good on his election-eve claim that he would “top the ticket.” John Connolly finished with 19,420 votes — in second place. Charlotte Golar-Richie finished third — 3900 votes back of Connolly; Dan Conley finished 2800 votes behind her, and Felix Arroyo took the fifth spot some 1900 votes behind Conley. John Barros finished a close sixth, 750 votes short of Arroyo. Consalvo and Ross finished seventh and eighth. For the 12 primary hopefuls, it was a polite campaign. No one wanted to go negative and this excite the others’ supporters to come out in larger numbers. Indeed, that 112,804 people turned out to vote in a love fest is a credit to the civic-mindedness of some 30 % of Boston’s registered voters. It was far different in 1967, when there was passion and drama all over the campaign, anger between candidates, riots at times in the city, and unrest the rest of the time. We can do without the riots, but everything else that made 1967 such a Shakespearean campaign we need plenty of. We need debate, we need anger; we need the two remaining candidates and their supporters to go at it hammer and tong. Because Walsh and Connolly really are very different men with very different agendas and support bases. None of it should be glossed over with pretty talk and grins. If the huge differences between these men do not collide with the sound of shoulder pads and helmets clanging, so to speak, it will man hiding these differences in the closet, to taint the administration of whomever wins, and to make the winner’s agenda distrusted from the start. 1. The “base” vote. Walsh did much better in his South Boston/Dorchester “base” than Connolly did in his West Roxbury/Roslindale homeland. 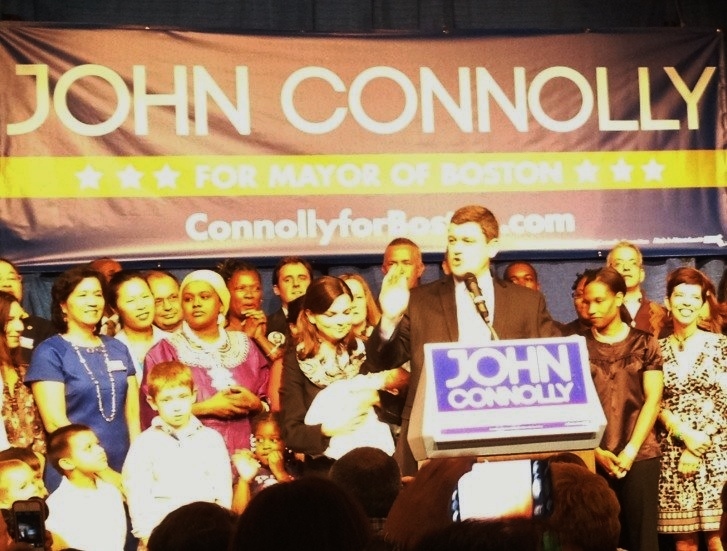 But Walsh did not have to compete with a seriously strong candidate in his base, as Connolly did with Dan Conley. Had Walsh had to give up 30 % of his home vote to a competitor, as did Connolly, Charlotte Golar-Richie would be in the Final today, not Walsh. 2. East Boston, Charlestown, North End, Downtown. These areas were to be John Connolly’s trump, his claim to city-wide strength, and so they were. He beat Marty Walsh convincingly in the region. But the turnout here was small. Connolly’s field organization did not do the job here that it should have. Had turnout in this region come even close to that in Ward 20, Connolly would have finished convincingly in first place. 3. Communities of Color. Despite valiant efforts, neither Walsh nor Connolly broke 75 votes in any precinct of Wards 8,11, 12, or 14. Nor in most precincts of wards 9, 10, 17, and 18. This entire region — maybe 25% of the City — now stands up for grabs, with no obvious inclination in either man’s direction. That said, John Barros should be on John Connolly’s first-call list right now, and Felix Arroyo on Marty Walsh’s. The supporters of each have a natural place in these respective campaigns. Charlotte Golar-Richie’s support, however, is the prize — and the mystery. Her agenda fits, more or less, with both Walsh’s and Connolly’s. 4. School Transformation. It was Connolly’s mantra, and it carried a lot of weight. But not enough. As Walsh well said on election night, “I am not the one-issue candidate in this election !” Connolly should immediately, if not sooner, grab the administrative reform issue that made Dan Conley a serious contender. Connolly should in particular pick up Conley’s brilliant series of neighborhood brochures listing specific administrative reforms, most of which hit the bulls-eye. Conley and Connolly are natural allies. If Connolly hasn’t called Dan already, he should do so NOW. 5. Unions. 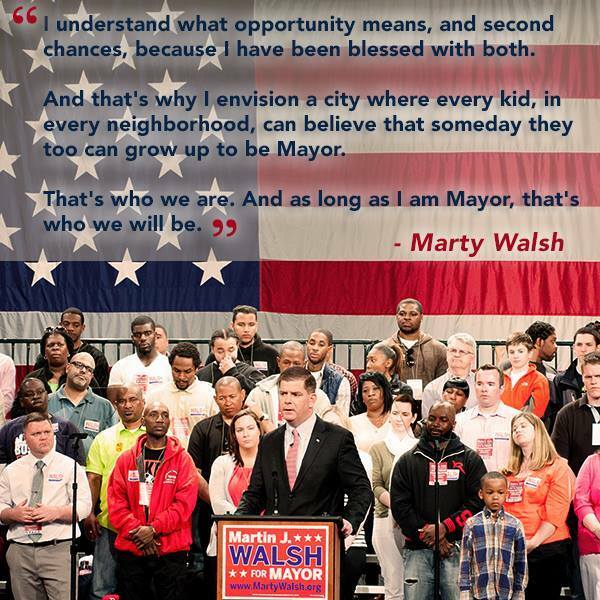 Huge, football fan-like support from union activists gave Marty Walsh a big Primary day field force. They got their vote to the polls. Nonetheless, Union support is not a strength for Walsh going forward. Labor activists can get 20,000 voters to the polls. They cannot get the 80,000 or so which will likely be needed to win in November. Unions generate strong opposition even in progressive Boston. No one liked the pressure the Firemen brought to bear on the City budget at their contract time; and the Big Dig, albeit an economic boon, is not forgotten for huge cost overruns in part generated by Union wages. Personally, I have no problem at all with union wages; hard working people deserve great pay. But the Unions that negotiate such pay often use tactics that alienate large swaths of people — who do not forget. Walsh needs badly to convince those who did not vote for him that he is not Walter Reuther. That said, the construction workers and the Firemen at least have strong ties to Boston people, ties that remain, at least in part, because these Unions are led by shrewd political leaders (of whom Walsh himself was one). The same cannot be said of the Boston Teachers Union (BTU). It endorsed two losing candidates — Felix Arroyo, justifiably; Rob Consalvo much less so — and now stands out in the cold. Neither Connolly nor Walsh are likely to enact the BTU’s agenda, especially its opposition to charter schools — schools backed by a huge majority of Boston voters — a meaningful longer school day, giving principals power to choose their teachers, or the seniority rules that caused 2012’s “teacher of the year’ to be laid off because he was junior in time on the job. Had the BTU acted shrewdly — by endorsing Connolly, for making the schools a prime issue, saying something like “we differ with Connolly on how, but we agree with him on the need for reform” — it would now be in a strong position to see some of its agenda included in the Connolly package. Didn’t happen. 6. A majority of the November winner’s vote will come from people who DID NOT vote for him yesterday. How does a candidate win the votes of those who did not choose him first ? One principle cries out : these voters will now vote for the candidate they DIS-like less. Thus the need that I presented earlier, to run a negative campaign; to DIFFER with the opponent, passionately. And there is plenty to differ with, for both Connolly and Walsh. Plenty on many fronts. A Final word from me : the campaign trend that I most reject is already developing : both campaigns are becoming institutionalized. Television theater. Connolly’s already had done so. Now Walsh’s too. This I hate. It makes the campaigns look phony and sound plastic. We have enough Plastic Men in our politics. I do not want to see Walsh or Connolly standing on a stage with an American flag behind them, like a President — which they aren’t — and what looks like a diversity audience at an Oprah show. Diversity is wonderful, but in such calculated displays it looks like window dressing. Let’s see Connolly or Walsh on stage by themselves, with no flags or fooforaw, just them, speaking to us all out in the crowd, on the street like a jury of 175,000. Previous PostMEEK AT THE MOVIES : PRISONERS ( 3 STARS )Next PostReciPee’d OFF! !